I’m Kate McKegg, Director of The Knowledge Institute Ltd, member of the Kinnect Group, and co-editor of a forthcoming book on Developmental Evaluation Exemplars. I want to share what we have learned about readiness for developmental evaluation (DE) by reviewing the experiences of and lessons from DE practitioners. DE isn’t appropriate for every situation. So, when we suggest that a client or community undertakes a developmental evaluation, we begin by jointly assessing appropriateness and readiness. Rad Resource: Differentiate appropriate from inappropriate DE situations. Hot Tip: Readiness extends to evaluators. 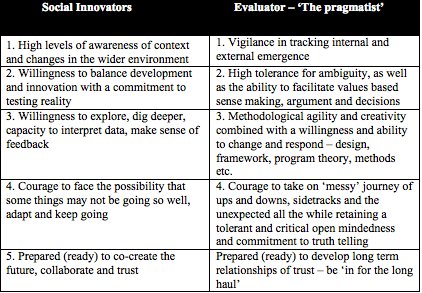 Developmental evaluators need a deep and diverse methodological toolkit and the ability to be methodologically agile. Hot Tip: Be prepared to use multiple methods from different disciplines, contexts and cultures, and to be adept enough to develop and adapt methods and approaches to work better in different contexts. Hot Tip: Know and practice the three DE dispositions. Embrace unknowability so as to be comfortable about not knowing in advance a sure destination, or known pathway to tread; acknowledge risks and go anyway. Develop an enquiring mindset, where the DE evaluator and others in the innovation team are open to possibilities, multiple perspectives, puzzles and learning. Be ready to persevere, to begin an unknown journey and stick with it. Alignment of values (the initiative and the DE evaluator) is essential for a DE journey; it’s shared values and trust that create the glue that holds people in relationship with each other. Hot Tip: Readiness applies to both organizations engaged in innovation and developmental evaluators. Look for readiness alignment. Cool Trick: Be honest that DE can be hard, is not appropriate for every situation, requires readiness and perseverance, and sometimes even courage. The American Evaluation Association is celebrating Developmental Evaluation Week. The contributions all this week to aea365 come from evaluators who do developmental evaluation. Do you have questions, concerns, kudos, or content to extend this aea365 contribution? Please add them in the comments section for this post on the aea365 webpage so that we may enrich our community of practice. Would you like to submit an aea365 Tip? Please send a note of interest to aea365@eval.org. aea365 is sponsored by the American Evaluation Association and provides a Tip-a-Day by and for evaluators. I appreciated this post and have three comments. 1. The ‘inappropriate’ column is the reality for many organizations and evaluators that work in them. While many people understand that the initiatives that they are working on are complex and in theory benefit from a DE approach, their organizations do not have the resources to dedicate to such approach, as in, their whole evaluation unit could be just one person or two people. External evaluators are an option, but only for those who can afford them. 2-Another challenge based on my experiences is that some organizations have used DE as an excuse for not planning. The only thing they take away from DE is that it is “emergent”. This is a real challenge for funders. Funders need to demonstrate to their donors that there is a plan. Now, that plan can change and SOME donors are comfortable with change if you have trained staff that can take the time to engage them and explain what a developmental approach is. But to refuse to say what it is you want to do because the work is ’emergent’ is not a practical option for funders. 3- “Organizations” have so many parts. Taking on a DE approach requires that many people in the organization understand what it is and what it is not, including the Board of Directors and those who do the fundraising. 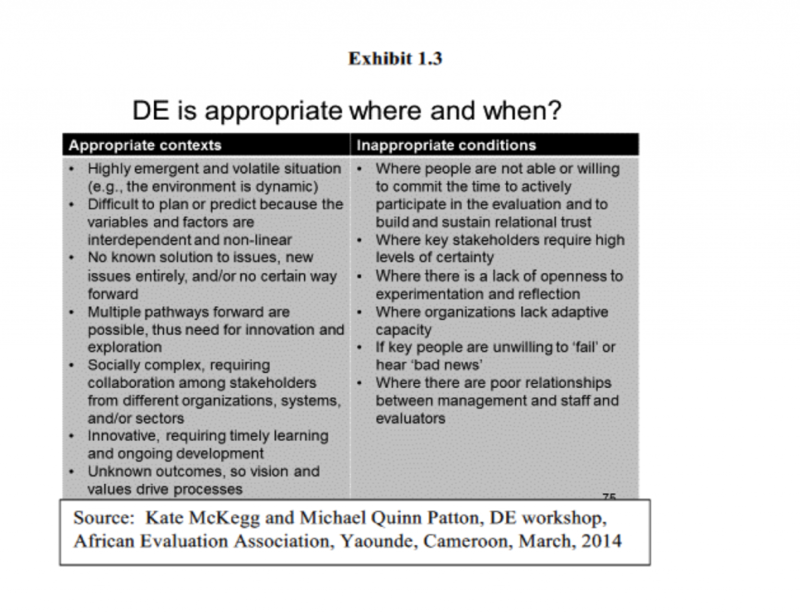 Otherwise efforts of evaluation units alone cannot make DE happen.